It Will be Lovely as a Table Topper, Too! If you’re looking for a memorable baby shower gift that’s different than the usual onesies and burp cloths look no further. This sweet playmat is simple to construct yet steps way outside of the arena of typical (and boring) baby shower gifts. Plus, it’s way faster to complete than many baby quilts are. The Cathedral Window design is constructed using a method that requires no basting, no traditional quilting, and no binding. Yet it’s soft and cushie to protect young ones from hard floors and charming to look at. In fact, it’s so pretty we’d gladly use it as a table topper (perhaps with less cushie batting). Plus, it will be wonderful in many color combinations. 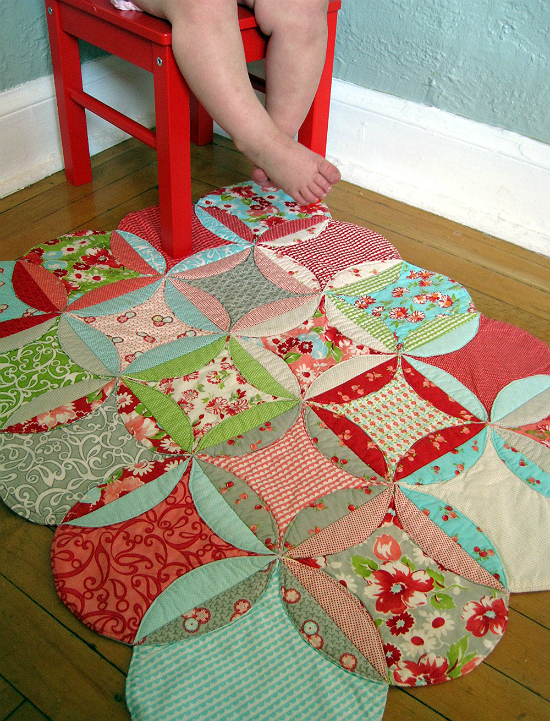 It’s perfect for a pretty layer cake of 10″ squares you haven’t known what to do with. The pattern, from Amy Gibson of Stitchery Dickory Dock, produces a 24″ x 29″ mat. 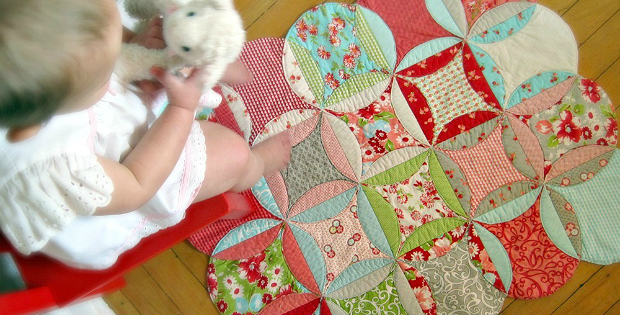 Click here for the free “Cathedral Window Baby Playmat” tutorial.